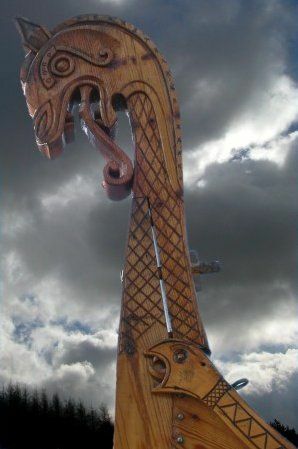 Dragonhead on the prow of a Viking longship. The historical districts of Scandinavia. The following probable tribal districts are noted among others: Uppland (political center of the Svears) including Vendel site, Ostergotland, Vastergotland, Smaland (small territories of other Gott/Gotar tribes), Gotland Isle (land of the Vagoth or Gutar), Oland isle (land of the Vagoth? ), Hordaland (land of the Aerothi? ), Ringerike (land of the Ragnaricii), Rogaland (land of the Rugii), Vestfold and Viken (main lands of the Raumarike/Raumaricii), Bohuslan (land of the Wulfings? ), Halland (land of the Hallin), Blekinge (land of the Bergio? ), Skane and Sjaelland (core territories of the Danes), Angel (cradle of the Angles), Jylland (land of the Jutes), Rugen island (probably colonised by the Rugii), Nordfrisien (North Frisia). The Vendel Culture period of the history of eastern and southern Scandinavia (including Jutland and the Danish isles) is the era before the classic Viking Age. The Viking Age lasted from AD 793 to the early 11th century, while the Vendel Era lasted from the mid-6th century AD to the end of the 8th century and is characterized by princely burials of warlords and warriors with impressive weapons. The later historical period and the homonym cultural conglomerate (Vendel Culture) took their name from the site Vendel at the historical district Uppland in eastern Sweden, north of Old Uppsala, the ancient centre of the Svear kings. The most characteristic cemeteries were found there. It seems that Uppland – where later the important cities of the Viking age Uppsala and Sigtuna were developed – was very important politically during the Vendel period. The area was rather the political center of the tribe of the Svears (Latin: Suiri and Suirones and according to Jordanes: Suehans, Nordic: Svear, Anglo-Saxon: Sweonas, modern Swedes) who expanded to it earlier coming from Svealand, their core territory in the south. Uppland means the upper land, the land in the north. The influence of the Vendel culture does not seem to have been strong in western Scandinavia, i.e. modern Norway. Iceland and the Faeroe Isles were not yet inhabited by Scandinavians (Finland is not a Scandinavian country as it sometimes is considered to be). The later known Nordic kingdoms or ‘nations’ had not yet been developed during the Vendel age. Scandinavia was inhabited by numerous North Germanic tribes and clans who were almost in constant war with each other. Even the sub-tribes and clans of the larger tribes were politically independent from each other, constantly fighting one another. It seems that at times powerful warlords appeared establishing ephemeral principalities or kingdoms. This is the time and the societies described in the Anglo-Saxon epic poem Beowulf, an epic possibly of Jute or Gotar origins. According to the literary sources and the chronicles (Jordanes, Beowulf epic and others) in this period the largest tribes of eastern and southern Scandinavia were the Svears (Suiri, Suehans, the Swedes), the Gotar (Geats, Gott) and their probable branches – the Gauthigoth, Ostrogothae, Vagoth, Gutar and Theustes – the Jutes (maybe a tribal offshoot of the Gotar/Geats), the Heruli (the major part of the tribe played an important role in the Age of Migrations in the continent), the Screrefennae (the Finns being probably the sole non-Germanic people in the region), the Bergio, the Fervir, the Wulfingas clan, the Hallin, the Danes, the North Frisians, and in modern western Schleswig-Holstein the metropolitan Saxons (the core tribe of the later Saxon confederacy). Western Scandinavia (modern Norway) was inhabited by even smaller tribes and clans, such as the Ragnaricii, the Raumaricii, the Otingis, the Rugii (possibly the core tribe of the continental Rugii allies of the Ostrogoths who settled in Pannonia and Italy), the Adogit, the Aerothi and others. The Vendel graves are very similar to some Anglo-Saxon ones excavated in Britain, mostly at Sutton Hoo in the principality of East Anglia. After all, taking into account literary, linguistic and other evidence, it is possible that the ‘Anglo-Saxon’ dynasty of East Anglia was of Svear or Geat/Gotar origins. In my point of view, there is a strong connection of the names of the Angles (forebears of the ethnic name of the English) and the Ynglings (Ynglingas, Scylfings). After all, they seem to have been both bearers of the Vendel cultural elements. Taking into account that the Angles were a small tribe (less numerous than the Saxons and the Jutes: possibly a few clans) I would hypothesize that they could be a tribal offshoot or kinsmen of the Ynglings. It is possible that the Angles – possibly originating from modern central Sweden – were at first established in southern Jutland and modern Schleswig-Holstein (their historic core territories) and then invaded Britain becoming there royal dynasties in East Anglia, Bernicia, Deira, Mercia and elsewhere. We must also take into account that both the Angles and the Ynglings were royal clans/dynasties in their territories that is eastern Britain and central Sweden respectively. The common Germanic people of the aforementioned Anglian principalities or kingdoms in Britain rather belonged to other tribes of the invaders than to the Angles (mainly Saxons). In any case, the Anglo-Saxon invaders in Britain were largely or rather mostly bearers of the pre-Vendel and Vendel cultural elements. The buried in the Vendel culture cemeteries of Uppland were rather powerful warlords and warriors. Maybe some of them were members of the Yngling royal family but this theory remains questionable. The numerous tribes of the Vendel age gradually began to join in larger tribal unions or confederations, usually by force, while most Jutes, Angles and Northern Saxons of modern Denmark and Schleswig-Holstein had already migrated to Britain at the beginning of this period: their migration started in the early 5th century AD, of the pre-Vendel era. The Svears and also the peoples of Scandinavia possibly related to the continental Goths, that is to say the Heruli (Heruls) and the Gotar (Gott, Gutar and/or Geats) and their branches of modern continental Gotaland and the Gotland Island, went on living side by side during the Vendel period (550-793 AD) and the Viking age (793– early 11th century AD). Finally after several confrontations, around the 12th century they joined in a single kingdom, after all not being significantly different in language, origins and culture. Thereby they were both assimilated in the Swedish nation. In the Viking age, the Danes seem to have absorbed the Fervir, Bergio, Wulfings and Jutes. It also seems that the total tribe of the Angles had already migrated to Britain, leaving their almost vacant homeland to the Dane newcomers. Your split in Scandinavia and Germany is not the viewpoint of vikings. Viking is not a folk, it is a “grasroot movement” a rebellion against the Franken under the Karolinger Dynasty and christian priest from England – in viking-view romanised people = Romans. Her pangan religion based of old roots. Jordanes had not written from Suiri that is not correct, correct is Svear, this is a late bronze-split from svebi (in german Svear = Schweden, Svebi=Schwaben). In Jutland had settled ca. 600 AD Saxon-King Offa in Angle and Friesians in Northfriesland of the Jutland penisula (after the anglesaxon migration to england). The Rugi is a tribe from Rugian island, but after the great migration lots of defeated tribes was gone to Scandinavia and lots old myths played in north germany e.g. Jomsviking Saga, Ragnarök and the oldest part of Edda.